Effects: relaxing, antiseptic, analgetic and appetizing effects. 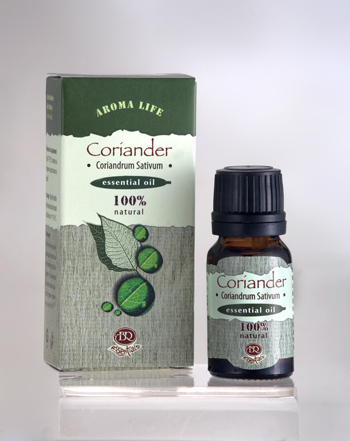 Benefits: Coriander is one of the more gentle spice essential oils and is a good digestive tonic, helping to relieve nausea and flatulence. It also restores and stimulates the appetite and may be useful in treating anorexia nervosa. The oil has antiseptic and soothing effects; it eliminates fatigue and feelings of nervousness. It also has analgesic and heating effects, for which it is applied in treatment of rheumatism and arthritis. Its antiseptic characteristics are used for treatment of flu, colds, food poisoning. Overall, coriander is revitalizing, refreshing and comforting. It is both relaxing and stimulating – a combination of properties that inspires creativity. It adds a pleasant and interesting note to massage blends and is good for relieving stress and irritability. Coriander is also beneficial during convalescence. Blends well with: bergamot, cinnamon, ginger, grapefruit, lemon, orange and neroli. Use: aromalamp, air fresheners, bath, massage. Attention: Contradicted to epileptics, pregnant women and nursing mothers, children under 3 years old and people with individual intolerance to this essential oil.